The alameda, or town square of Pontevedra city, is actually located at the southern edge of the main area of tourist interest and sight seeing attractions. The square is long and narrow and split lengthwise into a paved area lined with buildings on one side and a slightly elevated tree shaded corridor on the other. 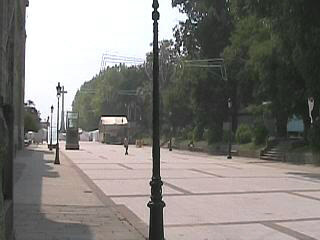 To the right is the slightly bleak paved area of the main square. The lack of people can be put down to the time at which the photo was taken, about 2.30pm and in the siesta period of the afternoon. This part of the alameda also hosts a busy tourist cabin that has several English language booklets and an English speaking representative as well. The tree covered area was being used for stalls and displays, associated with one of Pontevedra's festivals, when we visited in mid August 2005 and the paved area has two conveniently placed access points to a large underground car park beneath. 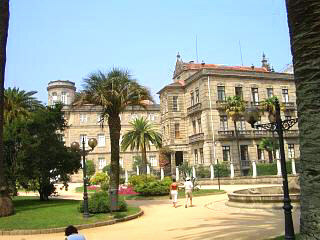 Pontevedra's alameda is nineteenth century and is called the "old orchard of the San Domingos convent". 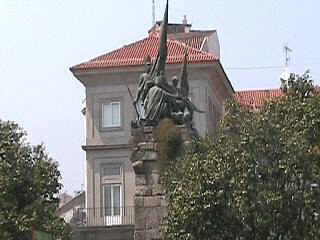 The extended plaza area also has two significant statues, one of Christopher Columbus and another that pays tribute to Pontevedra's victory over the French Napoleonic armies in 1808. At the far end of the alameda is a stair and this is lined with painted tiles by famous artist "Carlos Sobrino Buhigas". Whilst Pontevedra's alameda is far from the most inspiring you will see, it does have several notable buildings both on and surrounding it. 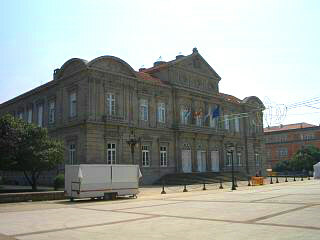 The first is the large "Pazo da Deputacion" which sits mid way down the square (see below). The "Pazo da Deputacion" is not all that old and was built in the late eighteen hundreds by "Alejandro Rodriquez Sesmeros". It is in no particular architectural style, but combines a number of features found across various design paradigms and is an eclectic combination that we found quite monumental. Today the building is the headquarters and exhibition center of an artisan organization and holds the "Bienial Art Exhibition". 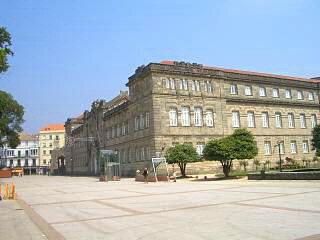 Immediately next to the "Pazo da Deputacion" is another, even larger building (photo top of page), with a similar "human devaluing" scale to its design. Although not mentioned in any of the city guides we obtained, this structure also adds to the "corridoring" effect from which the alameda benefits (or suffers). This building is one of several municipal and civic structures in and around the alameda and adjacent garden area. Behind both these buildings are the gardens of "Eduardo Vincenti" and again a couple of civil and municipal buildings to the side of them are very grand and impressive (photo left). The gardens themselves are quite large and feature a promenade lined with palms and one of the almost obligatory statues of Galician heroin "Rosalia de Castro", the famous author and poet. The gardens have several stop off points, in the form of benched seating and also have a restaurant "come" bar at the far end of the lawns. If you want to escape the busy hustle and bustle of Pontevedra, then these gardens are as good a place as any to find some serenity. Moving back to the alameda itself and continuing to head in a north easterly direction, the ruins of "San Domingos" church (from which the square takes its name) can be seen to the right. 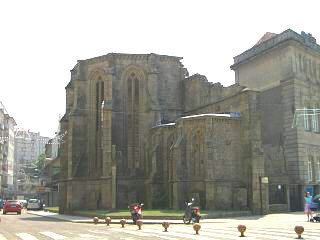 This was once the most important Dominican church in Galicia. These ruins (or at least the chevet) are actually quite intact and represent the remains of what was once a fourteenth century church (see right). Today these remains hold some artifacts of the museum of Pontevedra in the form of engraved and etched shields, coats of arms and grave stones. Some famous historic characters were also buried here including medieval knights like "Sueiro Gomez". As you prepare to leave the "old orchard of the San Domingos convent" you pass by the "praza de Espana" and the old town of Pontevedra awaits you. 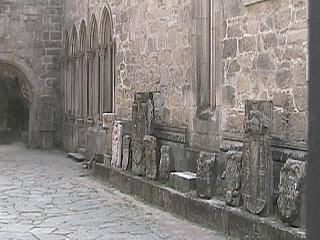 To the left, a selection of the shields, head stones and artifacts that represent part of the museum of Pontevedra and are held in the ruin of San Domingos church. The photograph below shows one of the alameda statues mentioned previously. I believe that this particular statue is the one that depicts the victory of the Spanish army over the French invaders in 1808. Back to the Pontevedra index page.